With large number of new features, improvements and bug fixes, iOS 9.1 has out by Apple for all iPhone, iPad and iPod touch. Apple has out five beta versions of iOS 9.1 during their testing period and according to apple they has patched several vulnerabilities in iOS 9.1 using Pangu jailbreak. They mean that iOS 9.1 jailbreak will be impossible. Anyhow, just get awesome features in iOS 9.1 download for your idevice also. Glad news is iOS 9.1 offers new features for upcoming Apple TV 4, the 12.9-inch iPad pro with new two accessories and it will support for smart keyboard and Apple pencil properly. iOS 9.1 will be the better, awesome experience with every touch. 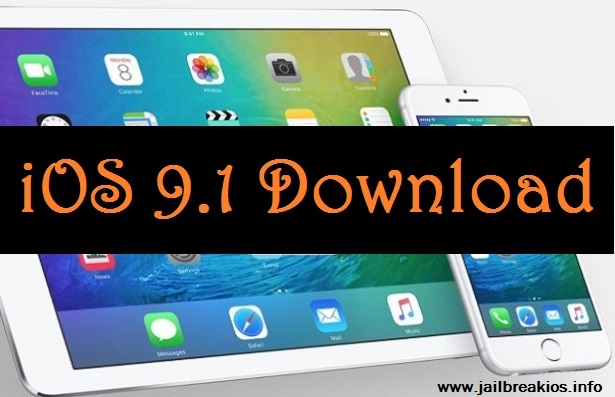 However, if you wish to take iOS 9.1 download facilities on your idevice, before you should know about iOS 9.1. Scroll down and read our instruction given below. Calendar issues fixed to become unresponsive in month view. Some stability improved like CarPlay, Music, Search, Photos and Safari. Activation problems on some carries are fixed. Fixed some message issues that no appears in a main search result. More than 150 emoji characters like taco, Unicode head, middle finger, burrito, cheese wedge and latest Unicode specification. New option for Message app settings which let you to disable photos for their contacts. Resolved an issue of incorrect unread mail count for POP mail accounts. Fixed some messages issues to no appear in main search result. Improved some stability of CarPlay, Safari, Photos, Music and Search. Apple users, who are thinking to upgrade their devices to iOS 9.1, please keep in mind that after updating, you can’t downgrade iOS 9.1 to older versions, because apple had already over the downgrade ability. Stated above, apple has prevented all jailbreak abilities using Pangu 9 jailbreak. It means that pangu 9 jailbreak tools do not support for iOS 9.1. We clearly say that there is not ability to jailbreak iOS 9.1. So if you are already using cydia, do not upgrade your idevice to iOS 9.1. You should wait until confirm iOS 9.1 jailbreak tool officially before updating your idevice to iOS 9.1. It will be better than everything. We sure all jailbreakers busy on iOS 9.1 jailbreak and we hope to see the tool so soon.